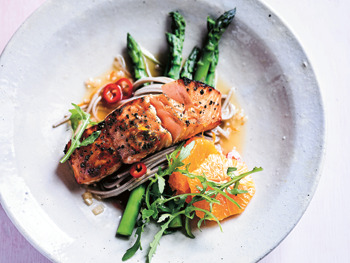 Soba noodles are best served cold and are the perfect foil for crisp hot salmon and a zesty citrus dressing. You can use any green vegetable with this, such as green beans or tenderstem broccoli. Slice the salmon into four pieces. Mix the soy sauce with the honey in a shallow glass dish, then place the salmon, flesh side down, in the marinade. Mix together all the citrus dressing ingredients. Slice the peel from the oranges using a knife and then cut into discs. Set aside. Bring a very large pan of water to a boil. Add a cup of cold water and then the noodles (the cold water helps slow down the cooking time to prevent the noodles from becoming soggy). Cook for about 7 minutes or until al dente. Add the asparagus in the last 30 seconds of cooking. Drain, rinse in cold water and leave to sit in the sieve until the salmon is done. Heat your oven grill. Place the salmon on a foil-covered baking tray. Grill for 6–8 minutes until crisp at the edges. If your salmon has skin, then remove it after cooking. Rinse the noodles again, to detangle. Arrange the noodles and asparagus on four plates. Top with the fish and orange slices and pour on the dressing. Sprinkle with the chilli and spice mix and serve with some salad leaves strewn over the top. Note: If you don't have the togarashi spice mix, substitute with black or white sesame seeds. A celebration of modern Asian cooking, in 100 healthy, flavour-packed traditional and modern dishes. 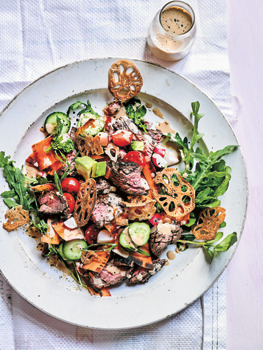 Bao buns, pho, sushi, poke bowls, gyoza, ramen and kimchi have devotees on every high street - now Jennifer Joyce shows how easy it is to create these zingy, fresh, healthy flavours at home. From grilled sticky skewers and steak tacos, salads, rice bowls and dumplings, to prawn katsu bao and miso-glazed ribs, this is an adventure in the dazzling diversity of modern Asian cooking. Jennifer's exquisitely simple recipes, no-nonsense explanation of ingredients, hand-drawn diagrams and beautiful photographs are all you need to start cooking in your very own Asian Kitchen. Jennifer Joyce is a successful food writer, author and stylist based in London. She is American-born but has been resident in the UK for more than 24 years. Working for leading UK magazines and newspapers, such as BBC Good Food, Waitrose Kitchen and Jamie Magazine as well as The Guardian and Daily Telegraph, she draws on her unique dual talents of creating mouth-watering recipes and styling the dishes for photography. Leiths School of Food and Wine in London hosts Jennifer's popular cookery classes and she has appeared on numerous TV and radio shows in the UK and US, including the BBC's Today and Good Food Show Live. 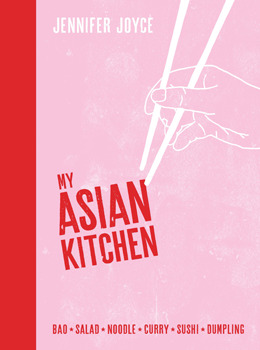 My Asian Kitchen is Jennifer's eleventh book. Her previous titles for Murdoch Books are My Street Food Kitchen, Meals in Heels and Skinny Meals in Heels. This dish has a bit of all the elements you crave in a good salad: crisp, chopped veggies, grilled meat and a punchy dressing. The list of ingredients might seem long, but it takes very little time to throw it all together. If you don't want to make the lotus wafers, you can buy them, replace them with something crunchy like rice crackers or just leave them out. Place the steaks in a zip lock bag and add the garlic, soy, honey and ginger. Marinate for 2 hours or up to overnight refrigerated. To make the sesame maple dressing, place the sesame seeds in a dry frying pan. Turn the heat to the lowest setting and let them slowly turn golden, about 10 minutes. Place in a blender with the remaining dressing ingredients and blend until it's a fine liquid. Scrape into a bowl and set aside. Heat a chargrill pan or outdoor grill. Brush the steak with the oil and grill on direct heat for 3–4 minutes each side for medium rare. Bavette/skirt steak can vary in thickness so if you have a very fat piece, leave it on the heat a little longer. Once cooked, let the steak rest for 10 minutes under foil. Thinly slice and set aside. To make the salad, halve the cherry tomatoes, thinly slice the radishes and spring onions and cut the baby cucumbers into coins. Slice the carrots into ribbons using a potato peeler and cut the avocados into 4 cm (11⁄2 inch) cubes. Place all of the salad ingredients into a large bowl and add the beef and lotus wafers. Pour the sesame maple dressing over the salad and toss together. Arrange on a platter to serve. Images and recipes from My Asian Kitchen by Jennifer Joyce. Photography by Phil Webb, Illustrations by Riley Joyce'.